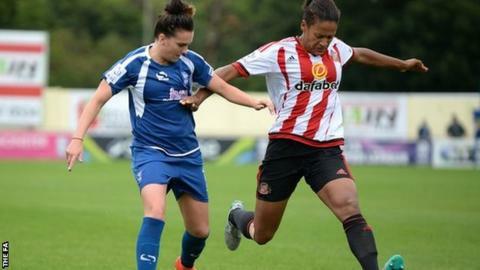 Defender Victoria Williams says Sunderland Ladies will "not go down without a fight" after reaching the last four of the Women's FA Cup. The Lady Black Cats beat Reading 3-0 to make the semi-finals with Arsenal, Manchester City and holders Chelsea. "If you want to win a trophy you've got to beat the best," Williams told BBC Newcastle ahead of Tuesday's draw. "Whoever we get, we'll prepare appropriately. We're not going down without a fight." Carlton Fairweather's side had drawn 1-1 with Reading in Women's Super League One on 26 March. Ex-Doncaster defender Williams continued: "We played Reading in the league last week and we felt that we underperformed quite badly. "So we had a chat first thing on Monday morning, we had a look through the videos, discussed what we needed to improve on and we applied that." Sunderland Ladies have only played in an FA Cup final once, losing 2-1 to Arsenal in 2009. "It would be massive if we get there [the final]," the 25-year old added. "It's every kid's dream, isn't it? You don't get many chances to play at Wembley and you've got to work hard to get there."